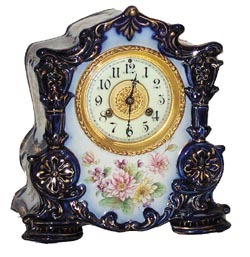 Waterbury Clock Co. "Porcelain No. 75", ca 1900. This Cobalt Blueclock is very similar to the Gilbert and Ansonia. Pink, yellow, purple flowers, a lot of gold. The case is 10 inches high, 9-1/2 inches wide. Porcelain dial ring, gilt center, American sash, beveled glass. 8 day, half hour gong strike. Many similar porcelains in Ly-Waterbury.